Renata Piazza is the mind, the heart and the soul of Hasekura 2.0 Program. She is the founder and director, BA in Japanese Culture and International Relations (University of Venice), Guest Research Student (Comparative Politics , Waseda University, Tokyo) , MSc in Politics of Asia (SOAS, University of London). In London, Renata worked for All Nippon Airways and Bank of Tokyo Mitsubishi. In 1999 moved to Barcelona where she worked as Project Coordinator for Casa Asia (Spanish Ministry of Foreign Affairs). 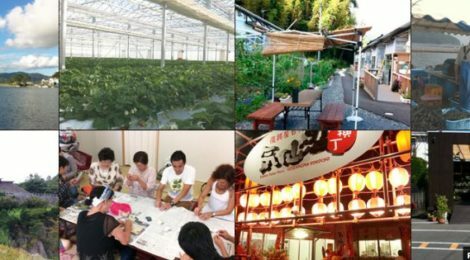 Right after the tsunami of March 11th 2011, Renata volunteered in the affected area and in 2013 set up the Association Hasekura Program to promote social innovation and business exchange between regions in Europe and Japan. 1. What Hasekura 2.0 Program is about? How was it born? Hasekura2.0 Program is a business exchange and training program for SMEs, social entrepreneurs and local authorities of Japan and Europe. It aims at creating a network of like-minded innovative business people at both ends of the world, through the exchange of information and problem-solving ideas. By doing so, we wish to create personal relations that will, ultimately, generate new collaborative business projects. We work around 4 main topics: Crafts & Design, Gastronomy & Sustainable Consumption, Smart Communities and Responsible Tourism, and support entrepreneurs that innovate on tradition for the creation of a sustainable future. The Hasekura 2.0 Program was born after the earthquake and tsunami that affected Tohoku, the North East region of Japan, in 2011, with the objective of connecting innovative projects emerged in the post tsunami Japan to similar projects in Europe. The tsunami represents a turning point in the history of contemporary Japan. It was an eyeopening event for many – especially the 30-something – young Japanese, who realised that the endless economic growth promoted by big business and the government, was not a priority for all Japanese; that Japan’s economic success had meant a big loss in cultural identity, regional unicity and connection to Nature and that it was about time to shift from a “money-making for the sake of it” economic development to a more human-centred form of socio-economic system. 2. EU and Japan are really far and different regions of the world. What can bring to a collaboration of these two actors in the fields of: craft&design, gastronomy, responsible tourism e smart communities? It is undeniable that Europe and Japan are very different in cultural terms. Yet in terms of economical development, Europe and Japan have many points in common. Since the 70s, Japan has been one of the world’s most advanced economies, even if in the past 20 years it has been generally believed that its economy was affected by an unhealthy recession, coupled with the emergence of the so called “lost Generation” of youth with no ambitions. The discourse about the “Lost Generation” and the standard by which we judge “ambition” is long and this is not the place to deal with it. What we believe is that there is a strong connection between the sense of urgency that the tsunami has generated in Japan and a similar feeling generated by the economic crisis in Europe as a consequence of the Lehman shock. Both events have offered to grassroots movements the opportunity to look for alternatives to the competition-based economic development model promoted by governments since WWII. The post tsunami movement in Japan is comparable to various similar movements that have emerged in Europe in the past decade or so (the Economy of the Common Good, the Transition Towns Network, Impact Hub etc) , but also various individual initiatives. Given the structural inability of governments to answer to the new challenges of contemporary society in an innovative way, Hasekura2.0 Program believes that connecting grassroots players who are facing similar problems in the world’s most advanced economies, will help promoting the socio-economic transformation our societies need. The connection we support is one that doesn’t pass through big metropolis, but one that offers the “inter-localisation” of regional business as an alternative to mass-scale globalisation. We have chosen crafts& design, gastronomy, responsible tourism and smart communities as the topics of our program, because thinking again, in a sustainable way, what we eat, what we use/wear, how we enjoy our leisure time and how we plan our cities/communities is necessary to create a smarter civilisation. The process of “rethinking” in the mind of the entrepreneurs we deal with, equals to innovating by rediscovering the balanced relation between humans and the environment; equals to adapting the knowledge of the past to the needs of contemporary society, and to using tradition to innovate for the future. We believe that in an interconnected world, where resources are becoming more and more scarce, international business cooperation rather than ruthless competition, is the best possible form of economic development for all. By exchanging ideas, mutually learning and cooperating, changing the “made in “ with the “thought by”, we can put the basis for the sustainable society of the future. 3. Hasekura 2.0 Program wants to create a bridge between EU and Japan, especially the Tohōku region. Why Tohōku? Which potentials does this region have? As we mentioned at the beginning of the interview, we consider that the tsunami of 2011 was an eyeopener and, even if it provoked the loss of too many lives and huge damage in the affected area, at the same time it acted as the trigger for innovation. Crisis are always opportunities and Tohōku, with its urgency to solve various pressing issues (population reduction, fast ageing, massive emigration to big metropolitan areas, social and environmental crisis…) has become a model for innovative thinking in Japan. 4. Which opportunities does Japan offer in the field of responsible tourism that can be followed , as an example, by EU? First of all we need to stress that the word “responsibility” in tourism is not commonly understood in Japanese, for a linguistic but also a conceptual reason. Nevertheless we have detected various examples of socially and environmentally responsible tourism in regional Japan, that are “labeled” as green, eco, human, relational,etc…tourism. More than becoming an example for Europe, we consider that promoting Japanese responsible tourism in Europe is a necessary step in order to discover the “real” Japan, far from the image of the hyper technological or the geisha/samurai and manga stereotypical image often known abroad. AT the same time, given the steep increase in foreign visitors registered in the past 2-3 years and the further increase expected by 2020 for the Tokyo Olympic Games, supporting responsible tourism projects in Japan will help preserving the identity and protect local economies. In this sense, we believe that the creation of a EU-Japan responsible tourism network, as Hasekura2.0 Program is currently developing, will be beneficial for both sides. 5. In which European Countries have you promoted and presented the project? 6. How do you promote your activities? Just through your Social Media channels? We still use SNS quite limitedly, at the level of our organisation. However, since the way the Japanese use FB is quite different from the use we do in Europe, at the private level I personally “recruit” participants and promote our activities through my private FB account. My FB account is actually a very powerful networking tool! Personal relations in Japan are very important and so Facebook allows me to keep alive the connections I establish during my frequent trips (4-5 times/year) to Japan even if I live in Barcelona. (Europeans and Japanese entrepreneurs). We also have a Twitter account…but improving our social communication is our big challenge for the near future. 7. What is the HASEclub? Who are the participants? HaseClub (Hasekurabu in Japanese!) is a close group of Japanese social entrepreneurs. Since we work around 4 different topics, many of the entrepreneurs that have participated in our program don’t know each other, even if many of them live in the same region. Yet they share a common vision and actively work towards a common goal for the creation of a more sustainable future. We thought that rather than acting independently, it would have been better if they knew each other and collaborated actively. Thanks to a grant we received from the Fukushima Prefecture, in 2015 we have started a new program consisting in 3 study sessions that have taken place in three different places of Japan. In line with the “new vision” of the Japanese entrepreneurs we work with, the success of our project will not depend on the extension of our network in Japan and Europe, as much as on the deepening of the current links we have already established. We want to offer more and more services and opportunities for the entrepreneurs and institutions that have participated in the program to connect among themselves and so generate new projects. In Europe, as mentioned above, we are gradually expanding to our countries. At the same time, from 2016 we will start “inbound missions” from Europe to Japan, study-tours of Tohoku directed to European professionals . In Japan, we wish to strengthen the relations between social entrepreneurs active in East and West Japan.